More bookings. Better efficiency. Power your best source of high-revenue earnings with Book. 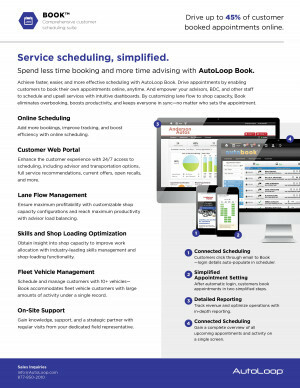 Streamline scheduling, engage more customers directly in the process and constantly optimize your shop capacity with Book. Delivering up to 18% of all customer-booked appointments online, Book gives customers added freedom and flexibility, consolidates scheduling tasks and keeps advisors operating at maximum efficiency. Features Include: Online Scheduling, Lane Flow Management, Service Ledger & more. Since acquiring this booking system, appointments are up. Pros: Tracking is good and customers respond by showing up. Pros: Easy to use, great customer service. Setting up appointments is easy. Pros: No over booking or losing appointments. They have the best support team. Cons: Wish they also had a DMS system. Pros: after using this product for scheduling appointments, and the drive tool (I-Pad) for the walk around, and write-up process. We couldn't be without it! It creates a seamless impressive experience for the customers, and a=our advisors love using it. Pros: We use this all day long in our Service Department. Pros: Very user friendly and does what we need it to do and more! Would definitely recommend.